Please refer to our stock # T0012 when inquiring. 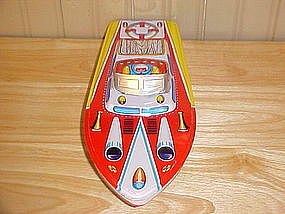 Fabulous large tin lithographed toy speed boat. This beauty was made in Japan in the 1950's. It is in very fine condition, it was never played with and found in original storage. It maintains at least 97% of its original paint, in vivid bright colors, only has some minor storage scuffs because it was stored in original box with others with no packing material. Most tin boats of this vintage are faded and rusted out due to heavy use in bathtubs and ponds. It has many raised embosed features and also doubles as a rattle. It measures about 12" long. It is marked " MADE IN JAPAN " twice and is signed " ST " in rectangle with Japanese writing.